With claws, scales, muscle, and more, monsters hold an unfair advantage in the life-and-death confrontations between adventurer and adversary. 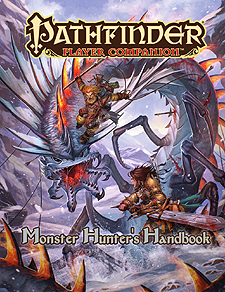 Turn the tables on them with Pathfinder Player Companion: Monster Hunter's Handbook, which is loaded with cutting-edge techniques for tracking beasts, slaying behemoths, and outwitting otherwise-overpowering creatures. Whether you have to skewer a basilisk or splatter an ooze, this volume contains everything you need!